With less than a week away to fight night, Shawn Porter, Kell Brook and undercard fighters talk about their training camp experiences and expectations surrounding their big fights this Saturday, Aug. 16 at StubHub Center in Carson, Calif. live on SHOWTIME®. In the main event, undefeated IBF Welterweight World Champion "Showtime" Shawn Porter will defend his title against fellow unbeaten British sensation Kell Brook in a 12-round bout. In the co-feature, Sakio "The Scorpion" Bika seeks to retain his WBC Super Middleweight Championship when he faces Anthony "The Dog" Dirrell in a highly anticipated 12-round rematch of their Dec. 2013 split draw. 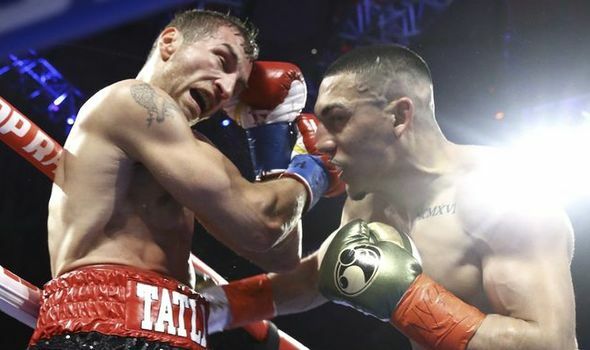 In the opening fight of the telecast, Omar "Panterita" Figueroa Jr. will put his WBC Lightweight World Title on the line when he faces mandatory challenger WBC Silver Lightweight Champion Daniel "Tremendo" Estrada in a 12-round bout. Fight week has arrived, and as the Aug. 16 fighters wrap up camp, they answer a series of training camp related questions that offer some insight into their final preparations for this Saturday's bouts. Q: You're essentially done with training camp at this point, how did everything go? 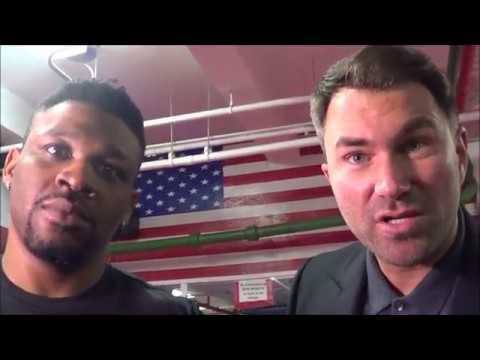 A: Shawn Porter (training in Las Vegas) - "Yep, it's all over as of last week. We just finished, and my dad was very happy with how everything went. We did 15 rounds of sparring to close things out." Kell Brook (finalizing his training in Las Vegas)- "We got some great work done. We're winding everything down, and I'm feeling fresh for fight night." Sakio Bika (training in St. Louis) - "Everything has gone smoothly. My team and I have been working very hard and they have been very supportive. The weather has been great, and I haven't had any injuries. So everything has gone well." Anthony Dirrell (training in Detroit) - "It's going well. It's just hard work. We've been working to make it harder than last camp so that I can keep getting better." Omar Figueroa Jr. (training in Weslaco, Texas) - "Everything is going well. This is one of the best camps we've had. We're excited for a great fight." Daniel Estrada (training in Mexico City, Mexico) - "I have been working very hard for the past five weeks. I've been running around 4:00 a.m. in the high altitude of Mexico along with my team that includes Juan Manuel Marquez, Ignacio 'Nacho' Beristain and Raul de Anda, and to know I am receiving the advice of one of the greats in the sport [Marquez] gives me the peace of mind that I am doing the right thing for this upcoming fight." Deontay Wilder (training in Tuscaloosa, Ala.) - "Everything has been going as planned. This has probably been one of the shortest training camps I've had. That thrills me though. A lot of fighters claim to be athletes, but on the night of the fight I'll show exactly how athletic and ready I am. I've been missing the ring and I'm ready to get back." Jorge Linares (training in Las Vegas) - "I'm very happy not only because I have a fight coming up, but also because I'm at home once again. I've been training with Ismael Salas for two years now and I feel like I'm at home here, so everything is going great." Q: We're less than a week from fight night. How are you feeling physically? A: Shawn Porter - "I'm in the best shape of my life, but I always try to stay prepared." Kell Brook - "Mentally strong, and physically ready." Sakio Bika - "I'm feeling very good, I'm ready to defend my belt. Everything has been great in St. Louis." Anthony Dirrell - "Great, if I'm not ready by now then I'm not ready. I feel ready to go." Omar Figueroa Jr. - "I honestly feel like I'm in the best shape I've ever been in. I only took a week and a half off after my last fight. So I've been super active ever since I started training for my last fight." Deontay Wilder - "I'm good to go. I'm always in shape. I'm always in the gym. I treat boxing like my nine to five. Others may not take it seriously, but this is a sport where you can get hurt if you don't protect yourself and take it seriously. So I'm always tuned up and ready to go for my fans." Jorge Linares - "[Fight night] It's basically here, so I'm excited and feeling well. I'll be on weight and ready to fight." Q: Has your game plan stayed consistent, or has it evolved since you started camp? A: Shawn Porter - "It stayed consistent. We always train hard." Kell Brook - "It's always been the same. We've been training 100 percent the whole way through." Sakio Bika - "Kevin (Cunningham) and I always do the same thing. He keeps me positive, focused and working very hard to get ready for Aug.16." Anthony Dirrell - "We're working on some of the same strategies and some different ones, but they're old things that I know will work on Aug. 16." Omar Figueroa Jr. - "We've changed a few things just because we want to try to encompass everything. We work on boxing, brawling, speed and movement. Hopefully it all comes together for me at the same time." Deontay Wilder - "This is boxing, and this is the heavyweight division. So you can't take anyone lightly. I'm not treating this like a warm-up. My main focus is fighting for a title, but I'm not looking past my opponent on Aug. 16." Q: What have you been doing to pass the time when you are not in the gym? A: Shawn Porter - "I'm normally at home relaxing, and I love going to the movies too. You can usually find me at one of the two." Kell Brook - "I rest and sometimes I like to have a walk down the strip. It's nothing too strenuous though." Sakio Bika - "We go to the movies, or I'll go to the mall and try to walk around and keep busy. This is not the craziest city, so there aren't a lot of distractions. That makes this a great place to train." Anthony Dirrell - "I like to play games. We've got a gaming system, and we go to the movies. We don't do anything too big though because the focus has to stay on the fight." Omar Figueroa Jr. - "I have my daughter with me almost every day. So I spend a lot of time with her. I also play video games." Deontay Wilder - "I love the water. So I swim a lot. I get massages. We go to the movies and I spend time with my kids. I'm traveling a little bit too. It's tough to fit everything in, but I'm love being a father and I love being around my kids. However, even when I'm away from the gym my mind is focused on boxing. I'm always working on things and trying to figure out how to get the world title. I'm so ready to go for the title fight that I shouldn't even need a training camp. I'll have one, but I feel like I'm prepared right now." Q: In terms of diet, are you doing anything specific during this camp? A: Shawn Porter - "Nope, we know what works and we know what got us here. We stick to that." Kell Brook - "Not really, I've just been sticking to it and staying in great health." Sakio Bika - "No, I'm not doing anything special really. I eat what I want to eat, but I eat clean. I never have to cut much weight." Anthony Dirrell - "No, I'm eating the same things as always. I don't have a problem with weight. I'm careful with what I eat, but I can eat what I want." Omar Figueroa Jr. - "Yes, this camp has been totally different. It has to do with me maturing as an athlete. I'm closely following my diet plan. I'm eating every three hours, and I'm avoiding sodium and carbs. I'm surprising myself this time around. I got myself in line because this is for the good of my career." Deontay Wilder - "No, not really. As a heavyweight I can basically eat anything. But I have a high metabolism as well so that helped. I just try to make sure to eat the right things." Jorge Linares - "I'm right on weight. I feel good and even though this fight is not at my regular weight of 135 pounds, I feel very good. Whoever can't make weight with the extreme heat here in Las Vegas, has serious issues. Thankfully, I feel very good." Q: What is the one thing you can't eat during training that you miss most? A: Shawn Porter - "I stay away from most things actually. My diet is typically just clean, organic food with lots of vegetables." Kell Brook - "There's no one thing really, I just try to eat healthy all around." Sakio Bika - "It's not about food for me. The one thing I don't have in training camp is my family and my friends. Here in training camp I don't have anyone, and I miss the people that are closest to me. I miss having breakfast and dinner with my family. But I know this is business. I'm here to train. I know in a couple of weeks and I can see those important people again, and they understand what I'm doing here." Anthony Dirrell - "No sweets!" Omar Figueroa Jr. - "I feel like I'm a pregnant lady with some of the cravings I've been having. Lately I've been wanting gummy bears, and pork rinds - stuff that I don't even eat normally." Deontay Wilder - "I'm staying away from the fried foods." Q: What is your biggest motivation while training? A: Shawn Porter - "It's all about the prize. I know what's to come and where I'm headed. 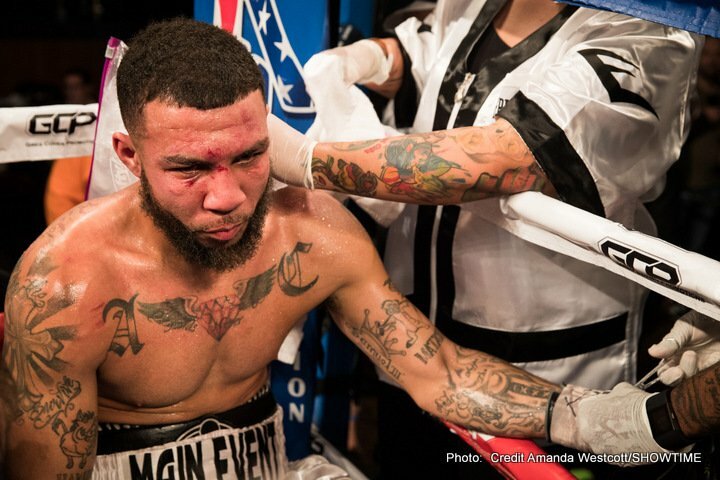 The outcome is what motivates me to put on a great performance for the fans on fight night." Kell Brook - "I like to prove people wrong and challenging myself. My family helps a lot too." Sakio Bika - "It's about family first because I have to come here and work hard to provide for them. I love what I'm doing, and I love boxing. At the end of the day it's about coming here so that I can put food on the table. That's why I wake up early in the morning." Anthony Dirrell - "My two-year-old son motivates me to make a better life for him and my family." Omar Figueroa Jr. - "My family is most important, and the kind of lifestyle that I'm able to offer my whole family means a lot to me. I want to look out for my parents and my brothers too. I want to be able to give them the lifestyle that they've always wanted. I'm prioritizing things like my daughter's college fund too." Daniel Estrada - "I have been waiting for this opportunity for almost a year. I've been the mandatory challenger for a while, but for some reason I couldn't get the fight for the title. Now the opportunity is here and I am very positive I will become a World Champion on August 16." Deontay Wilder - "My motivations is fighting for a world title. I need to go into the ring and take care of my opponent on Aug. 16. I have to fight to win and succeed in order to provide for my family." Q: What is your typical training day like during this camp? A: Shawn Porter - "My day starts with a 7 a.m. training session on the track that takes about an hour. Then I rest before heading to the gym to box from around 1- 4 p.m. Then I relax for a bit before heading for a massage and maybe an ice bath. I also like to work in some basketball on certain days." Kell Brook - "It all depends really. I start with a run in the morning. Then we do strength and condition. I spar in the afternoon, and then we do some technique work." Sakio Bika - "It's six days a week. I wake up at 6 a.m. and run. Then I eat breakfast. After that I go to gym, and at noon I work with Kevin and spar. We finish up around 4p.m. and then I rest. Later I eat dinner and go to bed early." Anthony Dirrell - "I wake up at 6:30 a.m. We train hard in the morning, and then I rest for a bit. Then we go to gym to box and spar. Later in the evening we do strength and conditioning training before bed." Omar Figueroa Jr. - "Right now I'm back to two times a day, but at the beginning of camp, I trained three times a day. I wake up and go to the gym around 11 a.m. I have insomnia so I go to the gym a little later. I start with strength and conditioning. 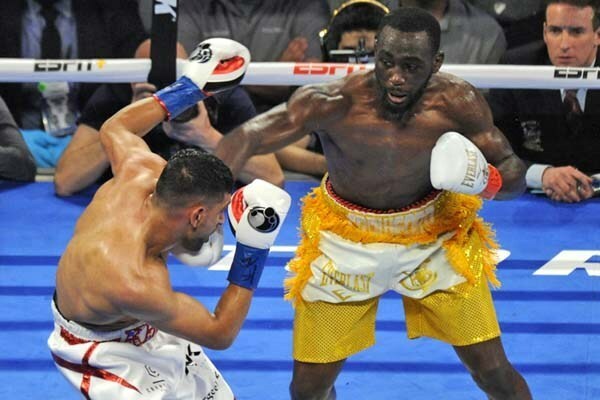 Then we do boxing around 2 p.m. or 3 p.m. We finish up with a night run around 11 p.m."
Deontay Wilder - "We hit the bags for a couple of rounds and listen to some old school funk why we get warmed up. Then, I hit the heavy bags for a couple of rounds and we do uppercut work. Every day is different though. Sometimes we switch things up and will keep things as exciting as possible. The same thing every day gets boring, so we like to change it up and keep it fun." While each fighter has similar tendencies training, each pugilist has their own story. Please see additional questions below. Q:Has Vegas become your favorite place to train? A: "I love to mix it up and go to different cities sometimes to train, but top to bottom I'd say Vegas is the best." Q: What makes Vegas so appealing as a backdrop for training? A: "This being home now makes everything that much easier. Nothing's complicated and I'm able to keep it easy." Q: You're obviously coming off of a smashing KO win against Paulie Malignaggi this past April. Can you describe how the aftermath of that fight impacted your approach to this camp? A: "More than anything, it made me realize that I need to put on another spectacular performance this time around so that I can get what's coming." Q: Kell Brook is going to be the first Brit you've faced professionally. Do you expect anything different from him stylistically, and are you preparing differently for him? A: "No, nothing specific. There's nothing too complicated or unorthodox about his style. So I didn't need to bring in any kind of specialist to spar, or plan for anything too different." Q: You've talked about your familiarity with fighting in the U.S. once previously in Atlantic City, and you mentioned how fighting outside of England might actually lessen your stress level heading into the biggest fight of your career. Would you elaborate a bit on that and why you'll be so comfortable fighting for a title in Carson, Calif.? A: "I'm confident because I've been here before and I'm very well prepared. I have my family with me too. When I box at home in front of eight or nine thousand people who know me there's a little more pressure. When I come over here it can be easier to focus on the fight." Q: You made the trip to the U.S. for this fight on July 30. How was the travel, and do you think that finishing up the last two weeks of your training in the U.S. prepared you as well as your training regimen back home? A: "Yep, I travel well, and I'm in good company. They keep me smiling. "I'm ready now though. We've just been putting in work and now it's all about enjoying this and being ready." Q: This will be your third professional bout against an American fighter, but both of your previous two were against Carson Jones. From your experience in those two fights, and from watching video of other U.S. fighters, do you notice anything different stylistically about U.S. fighters, and does that change your preparation in training camp at all? A: "I believe I can adapt to any style. I've been sparring with some American fighters. They do have some unique things about their style. But the best fighters know how to adapt, and that's what I'll do." 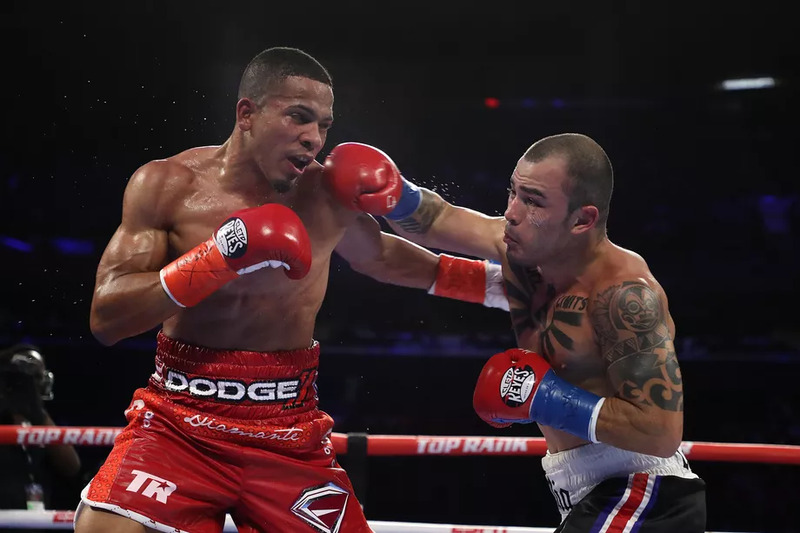 Q: Are you preparing differently for Dirrell this time around? A: "I'm not going to change too much. I'm coming out to fight. I don't want to run around and chase him. I'm going to show Anthony that I'm ready to do exactly what I've always done: to make people happy to see me fight. If he wants to take my belt off of me he better come prepared." Q: Is there one specific element of Dirrell's repertoire that you're working especially hard in camp to combat better when you meet this Saturday? A: "The main thing I have to do is keep working hard every day and getting my rest when I can. I'll be ready for Anthony. I always come to fight. I'm sure that I'm doing everything the way that I'm supposed to. And I'm training hard with my team so that I can defend and retain my belt." Q: How, if at all, do you think fighting him at StubHub Center in Carson, Calif. will differ from the fight you had at Barclays Center? A: "Not at all because I've fought before in an open arena, and I've fought in California before too. Anywhere they put a ring, in a shopping mall, a movie theater, I can fight anywhere." Q: Are you preparing differently for Bika this time around? A: "It's basically the same, just tweaking a few things here and there really." Q: Is there one specific element of Bika's repertoire that you're working especially hard in camp to combat better when you meet on Aug. 16? A: "Not really, he's going to be the same fighter. I'll stick to my game plan and fight my fight, and he'll do the same." A: "It makes no real difference. A ring is a ring. It's going to be one on one no matter what." Q: You decided to make some changes to your training regimen coming into this camp. You're now training with your father instead of Joel Diaz, and you've moved your training back home to Weslaco, Texas. Can you talk about why you decided to change things up? A: "It's just because of my daughter. I see her every day now. It was very hard for me to leave and not be able to see her. That's a big part of why I had to get my act in line." 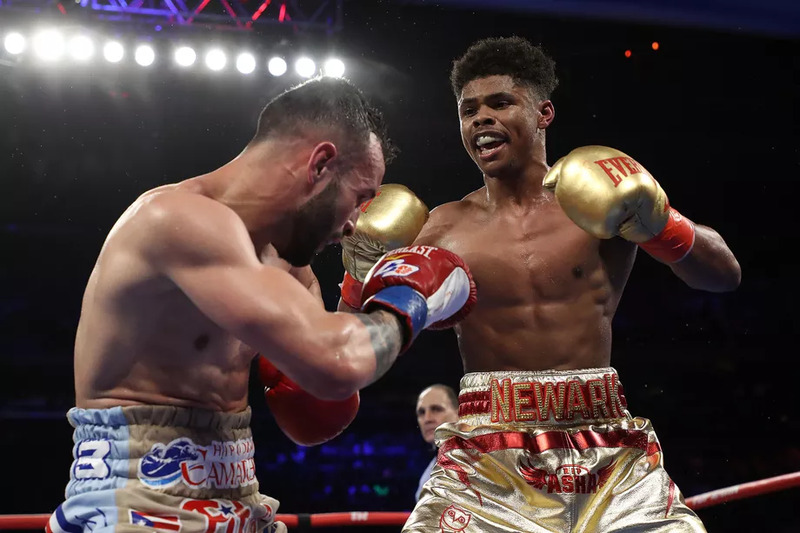 Q: After you had your April fight at StubHub Center, did you learn anything from that experience that may have altered your training now that you'll be returning there? A: "Definitely, the April fight wasn't a hard fight. It wasn't as physical as I'm used to fighting. The biggest thing was keeping my weight where it needs to be heading into this fight." Q: Are you excited for your first opportunity to fight professionally in the U.S.? A: "I am planning to take advantage of all the things I did in the gym. All the sacrifices will be paid back with a positive outcome on Saturday. I know I did the right things in training, and we have the right strategy at the gym, so there will be no excuses whatsoever." Q: Your dominance in the ring has been well documented. With none of your professional opponents making it past the fourth round, do you ever feel like it's a struggle for you to stay disciplined and train? A: "Discipline is a mental thing, and I'm mentally strong. All of the hard work is in the gym and with the sparring. When it's time to actually fight that's the easy part, and it's more fun actually. But it's not hard for me to stay disciplined at all. I've changed lots of things regarding my style. I'm more patient now. I'm definitely a thinker now and that maturity helps me. People will find out that I'm a different kind of guy. They'll see when I become the heavyweight champ just how disciplined I am." Q: How do you handle training for an opponent yet to be named, and how does that uncertainty impact your training? A: "Camp has been the same as always. 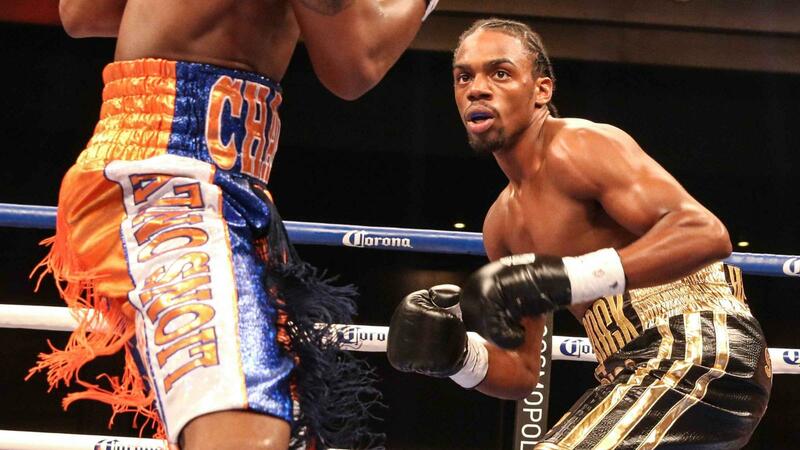 We're not looking past August 16, but we know to prepare for Stiverne. That's how confident I am in my ability and skills. I'm not worried about people picking the 'right guy' for me. I would be the laughing stock of the world if I had the title fight lined up and lost this fight on August 16. So I just have to get the job done next week and we'll go from there." Q: Do you believe that you have a distinct advantage going into your fight thist week? A: "I always think positively, you have to jump in the ring thinking like a winner. I trust my training, my trainer and my corner. We don't have any negativity at all. We feel good and prepared." Q: Are you feeling the pressure of needing to secure a win h in order to get a shot at a world title? A: "It's obligatory; I have to win on Saturday, without a doubt. There's no thinking about losing, I have to get a good win this week and then we'll look for that world title. Winning that world title is the only thing present on my mind."